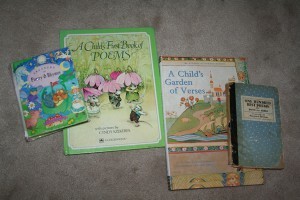 This entry was posted in Uncategorized and tagged books, Homeschooling, preschool by Charity Hawkins. Bookmark the permalink. I had a favorite book of poems, but I can’t remember the name of it. It had a big head on the cover and it was filled with silly poems. I will definitely be checking these out for my children. I read your post at Icanteach and I really enjoyed it. Thanks for sharing. Hope to see you at True Aim! Hi Tulip, I wonder if it was this Shel Silverstein book? A light in the attic? He’s the master of silly poems. I still remember the one about Always Put Pepper in Your Hair so that if you’re ever kidnapped, it will make the kidnappers sneeze and you can run away! My son loves his silly poems. I don’t know what True Aim is, but now I will go find out!